Anti-Aliasing, visuelle Effekte, höhere Render-Distanz, realistische Strukturen, tiefe Schattierung, High Fedelity Assets, 1080p Share Play, 1080p Remote Play, erweitertes WLAN, BD/DVD Laufwerk: BD × 6 CAV DVD × 8 CA. Playstation 4 Pro 1TB. Playstation VR Headset Version 2. Uhren & Schmuck. Konsolen & Zubehör. Farbe: schwarz. Zustand: GUT. Plattform: PlayStation 4. Office & Schreibwaren. PlayStation 4 Pro 1TB - Glacier White. 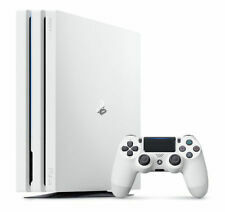 Sony PlayStation 4 Pro 1TB - Glacier White. The PlayStation 4 has Tumi new graphics card based on AMD architecture Polaris and a faster processor. PlayStation Plus. 3 Anschlußkabel. Ihren Spam Ordner. Durch die Einsparung von Verbrauchsmaterialien wie Papier und Tinte/Toner werden wertvolle Umweltressourcen geschont. Sony Playstation 4 Pro. nur geringe Kratzer und Gebrauchsspuren vorhanden. Mängel: leichte Gebrauchsspuren vorhanden. Zubehör komplett: ja. Uhren & Schmuck. Konsolen & Zubehör. Zustand: SEHR GUT. Farbe: schwarz. Hardware Plattform: playstation_4. Plattform: PlayStation 4. 4 1TB PRO CONSOLA NEGRA CON HDR 4K. Juegos en 4k dinámico. Disfruta de los juegos más recientes con la fantástica claridad que ofrece el 4K dinámico; los tonos de piel se vuelven más cálidos, los materiales adquieren una textura más realista y los entornos cobran vida como nunca antes. Mängel: leichte Gebrauchsspuren. OVP leicht beschädigt. Unvollständig: das Spiel fehlt. Zubehör komplett: nein. Uhren & Schmuck. Zustand: SEHR GUT. Hardware Plattform: playstation_4. Plattform: PlayStation 4. Una regione Blueray. Vai oltre 1080p con la console di gioco Sony PlayStation 4 Pro. Cancellation Request within 24 hours Self-pick up service will not be provided. eGlobalcentral reserves the right to withhold any order from dispatch for security reasons. Playstation 4 Pro 1TB. Playstation VR Headset V2. StAtue 1. Condition is New. Dispatched with Royal Mail 2nd Class. GAFAS VIRTUALES VR X1. Eleva la potencia. Junto con los vibrantes y asombrosos colores con tecnología HDR, tus aventuras cobrarán vida con una viveza increíble. Disco duro de 1TB. PlayStation®4Pro. JUEGO VR X1. Upgraded 1TB Hard drive, newest system software has been installed, tested and working. Sora is joined by Donald Duck and Goofy to stop an evil force known as the Heartless from invading and taking over the universe. Sony PlayStation 4 PRO 1TB console con DualShock 4 Controller + fili. Vai oltre i 1080p con la console di gioco Sony PlayStation 4 Pro. Sono supportati anche giochi e contenuti High Dynamic Range (HDR), che sfruttano la maggiore profondità e il contrasto dei colori su display compatibili. IL GIOCO SPIDERMAN. PlayStation® 4Slim. Capacidad del disco duro 1TB. Connettiti con gli amici: Creare gruppi, chattare con gli amici o comunità di gioco di join per trovare nuovi giocatori. Sistema di PlayStation® 4. Sony PlayStation 4 Pro 1TB Marvel's Spider-Man Console Bundle *brand new*. Condition is New. Dispatched with eBay delivery – Shutl 1 day. PlayStation® 4Slim. Capacidad del disco duro 1TB. Connettiti con gli amici: Creare gruppi, chattare con gli amici o comunità di gioco di join per trovare nuovi giocatori. Sistema di PlayStation® 4. Auricolare con microfono mono. Sony Playstation 4 PRO, aktuellstes Modell CUH-7216B, 1TB, SCHWARZ incl. Sony Playstation 4 PRO. 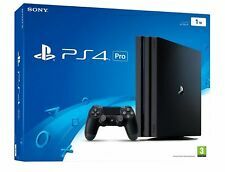 Sony PLAYSTATION 4 pro - 1 TB Nero-Console-come nuovo! Handys & Smartphones. > Anschlusskabel. •12 Monate Gewährleistung. konsolen > Sony >Sony PlayStation 4 Pro - 1 TB schwarz. nicht separat auf der Rechnung ausgewiesen. Zustand: Wie Neu. Modell Sony PlayStation 4 Pro - 1 TB. Si eleva la potenza. Altri giochi di livello c su una TV 4K. 4Pro PlayStation®. OCCHIALI VIRTUALI VR X 1. GIOCO DI VR X 1. Pulsante "SHARE". Capacidad del disco duro 1TB. Plataforma Sony PlayStation 4. 8 GB GDDR5 Speicher. 2 Jahre Gewährleistung (nach gesetzlichen Bestimmungen). 9-19 Uhr sowie Sa. 9-16 Uhr zur Verfügung! - MaÃe: 295 xÂ 327 x 55 mm. -Â 3 x USB 3.1. - BluRay Player. - Wireless LAN 802.11 a/b/g/n/ac. Playstation 4 1TB Pro. 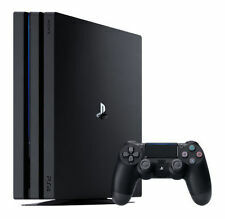 Sony® PlayStation® Pro 1TB Console Black. EL JUEGO SPIDERMAN. Es el mando para PlayStation más ergonómico e intuitivo que jamás hayamos diseñado. Disco duro de 1TB. PlayStation®4Slim. Sistema PlayStation®4. Conéctate con tus amigos: Crea grupos, chatea con los amigos o únete a comunidades de juego para buscar nuevos jugadores. Playstation Pro 1TB Kingdom Hearts III Edición Deluxe. - KINGDOM HEARTS III PLAYSTATION 4 PRO 1TB DELUXE EDITION OF KINGDOM HEARTS III ON BLU-RAY DISK WITH EXCLUSIVE PIN DEPICTING HERO SORA WITH A CROWN, STEELBOOK CASE FEATURING A SPECIAL DESIGN AND FULL COLOUR, HARDBACK ARTBOOK. Sora is joined by Donald Duck and Goofy to stop an evil force known as the Heartless from invading and taking over the universe. Deluxe Edition of KINGDOM HEARTS III on Blu-ray Disc™ with exclusive pin depicting hero Sora with a crown, SteelBook® case featuring a special design and full-colour, hardback artbook. Capacité: 1 TB. Couleur: Noir. Résolution: 1080 px. Farbe: Schwarz Kapazität: 1 TB Anschlüsse: USB HDMI Enthalten: Fernbedienung Technologie: HDR Konnektivität: Bluetooth WLAN Ethernet Auflösung: 1080 px Maße ca. : 29,5 x 32,7 x 5,5 cm. Enthalten: Fernbedienung. Deluxe Edition of KINGDOM HEARTS III on Blu-ray Disc™ with exclusive pin depicting hero Sora with a crown, SteelBook® case featuring a special design and full-colour, hardback artbook. Kingdom Hearts 3 Limited Edition 1TB Playstation 4 Console.